According to a recent study, more New Zealanders sing in choirs than partake in almost any other leisure activity. The choral canvas in New Zealand is embroidered with a rich tapestry of vocal ensembles, ranging from school choirs, community and church choirs, through to a number of fine chamber choirs and three outstanding national choirs: the New Zealand Secondary Students’ Choir, the New Zealand Youth Choir and the Voices New Zealand Chamber Choir. 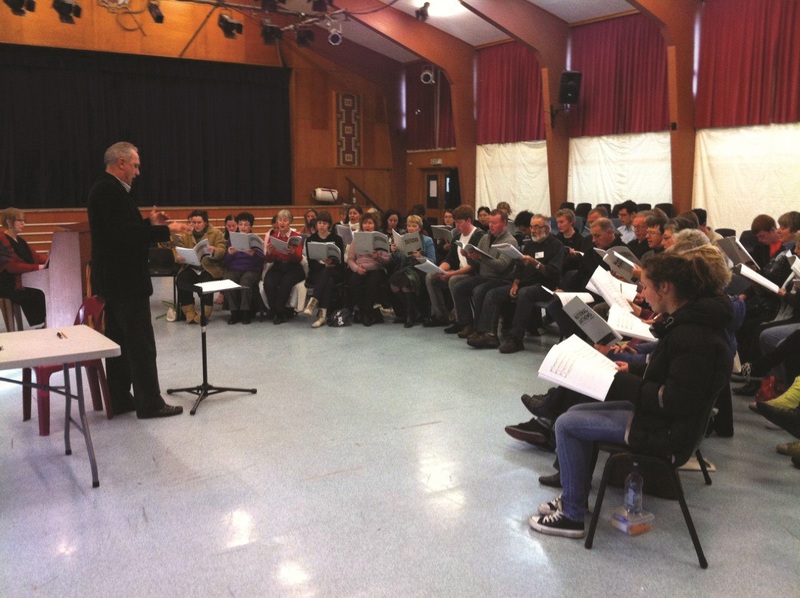 The choral scene in NZ secondary schools is vibrant and diverse, with most schools having at least one choir – a number of the larger schools with a strong tradition boast 3-4 choirs, and several schools also have barbershop ensembles and/or Māori performance groups. A highlight of the school choir programme is the annual secondary schools choral competition The Big Sing, run by the New Zealand Choral Federation. The Big Sing is New Zealand’s largest choral event, with approximately 250 schools, comprising some 7,500 singers, entering 11 regional competitions held in major centres around the country. A total of 18 choirs are chosen from the regions to perform at the National Finale, around two months later, competing for bronze, silver, gold and platinum awards. These are judged by a panel of three, including two leading New Zealand choral practitioners and one international judge. Choirs must perform across three categories and must include at least one New Zealand composition in their programme. This could be a traditional Māori or Pacific Island piece, and there is a special award for the best performance of a New Zealand work with a text in Māori. Although the standard of choirs at the upper end has been steadily rising, as a result of the fierce competition between choirs and the opportunity for students and conductors to observe the top student choirs in performance, it has been a cause for concern that many of the same schools make it to the finals year after year, while the great majority do not have the opportunity to see the very best in action. To address this, the NZ Choral Federation has introduced a ‘guest choir’ programme, with places for 4 choirs to attend the National Finale and take part in workshops with leading choral clinicians, in order to help them cross the threshold into the upper level of choirs. The NZCF runs an equivalent festival for primary school choirs called The Kids Sing but, to date, participation in this festival has been limited to only 4 regions in New Zealand. This is in part due to the fact that two of the main centres, Wellington and Christchurch, have run their own very successful independent festival for several years now. While there are some excellent conductors in primary schools, in general, the skills level amongst conductors is limited. The New Zealand Choral Federation is working on developing better resources for primary school conductors and plans to offer professional development workshops for primary school teachers. At the community choir level, New Zealand has a vast array of choirs in all the main centres, and in many of the smaller centres as well. These range from large-scale choral societies that perform with local orchestras and, at times, the New Zealand Symphony Orchestra, to choirs with a special focus, such as early music ensembles, world music choirs or barbershop choruses. The New Zealand Choral Federation runs a series of festivals for local choirs under the banner SingFest. These were formerly run as competitions, but have latterly become non-competitive festivals with a visiting choral expert who may workshop a massed item or provide a written report on the performance of each individual choir. A major event in the New Zealand choral calendar is the Sing Aotearoa festival. This event is a festival/conference mix with a strong emphasis on professional development for choral singers and conductors. The festival profiles Western tradition, Māori and Pacific singing styles in a unique multicultural blend. Incorporated into the programme are workshops with top New Zealand practitioners, as well as well-known international choral identities. Simon Carrington (UK) and Sanna Valvanne (Finland) were the guest presenters in 2009. The next Sing Aotearoa festival is scheduled for 2013.
singers can choose when they can attend, rather than making a weekly commitment, and only pay for the rehearsals they attend. As a result, the choir’s membership is very diverse and since they began keeping records (5 years ago) over 1,850 people have come through the door. The average weekly attendance is currently around 170. The choir sings music originating from different choral traditions around the world, including New Zealand. Other choirs of a similar nature have formed around the country over the past 5 years, some of them directly influenced by the work of Julian Raphael. New Zealand’s cultural demographic profile is changing rapidly. For much of the 20th century, Maori and Pacific Islanders made up less than 10% of New Zealand’s population. Today, roughly 30% of New Zealanders are Maori, Pacific Island or Asian, and that is expected to reach 50% by 2050. The barbershop tradition has a particular appeal for young Maori and Pacific Island singers, and there is keen competition at the National Young Singers in Harmony competitions for secondary school quartets and choruses, both male and female. New Zealand’s top high school quartets and choruses have performed with considerable success in the US. In particular, the Musical Island Boys, a quartet combining Pacific roots with traditional barbershop, won the 2006 World Championship Under 25 Gold award in Indianapolis, the first quartet from outside the United States to earn this prestigious trophy. Michael Stewart has provided an overview of church choirs in New Zealand and Dr Karen Grylls has written about New Zealand’s national choirs. Their articles plus this one combine to form a snapshot of the rich variety of ensembles and activities that colour the New Zealand choral canvas.